And yet they kind of go together, as I found out this week while live-tweeting the San Francisco Opera’s performance of Wagner’s Die Walküre, a four-and-half-hour epic noted for its ambitious staging, bravura solos, massively overwhelming orchestration and ladies with pointy Viking hats. Yes, I was the annoying guy sitting amid a sea of evening wear in a T-shirt and sneakers, holding an iPhone as low as I could and trying to not to get kicked out by the ushers for violating the house “no electronic devices” policy. You might think that Twitter and opera (not the browser) don’t work together. On the one hand, you’ve got epically long, rich visual and auditory feasts for the senses that require significant education to appreciate. On the other, you’ve got a text-only medium that restricts you to 140 characters, is free to use, and currently reaches more than 30 million people, who use it to broadcast such prosaic items as what they’re wearing, whether its raining or if Ronaldhino has just scored a goal. On top of that, opera is, well, old. I think the medium was last popular in about 1895, whereas Twitter is very much a child of the 21st century’s always-on, internet-saturated lifestyle. 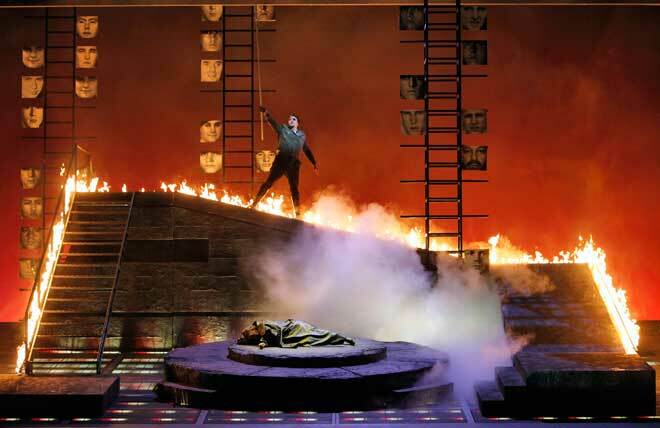 But if you treat opera as an event, it sort of makes sense to integrate it with Twitter. After all, people have live-tweeted Steve Jobs keynotes, ballgames, breaking news events and even births. Twitter is very well-suited to giving people a glimpse of something as it happens, adding a communal (and even global) dimension to real-time events. So why not opera? On top of that, there’s a natural affinity between Wagner and geek culture, as former Wired.com reporter Alexis Madrigal and I realized when we first hatched the plan to live-tweet the opera. Wagner’s Ring cycle, of which Die Walküre is a part, is the original source for many geek-culture touchstones, from The Lord of the Rings to Dungeons & Dragons to Star Wars. Dwarves, giants, a magical ring that corrupts its owner while granting absolute power? A storyline that wrestles with big notions of human technology versus nature? Enormous, fire-breathing dragons? Wagner’s got everything a geek could want. And did I mention the fog effects and the fire? So it seemed somehow natural that I would try live-tweeting a Wagner opera. When the San Francisco Opera’s press office offered me a couple of tickets to the performance, I jumped at the chance. (I didn’t tell them about my plans to tweet the thing). Based on the reaction I got from those who followed the event through my updates, it went pretty well. And, as far as I know, this is the first time anyone has ever tried to live-tweet an opera performance. I tried to give a blow-by-blow account of what was happening onstage. Sometimes, that meant describing the scenery — a difficult task, given how impressive San Francisco’s new production of this opera was. It included abstract video intros to each act, visually rich sets, great costumes, fire, lightning, fog effects and, of course, world-class musical performance. There weren’t actually any ladies in Viking hats, by the way. This performance went with a more modern look, setting Valhalla in a kind of high-altitude, mid-1930s-style boardroom and putting the Valkyries in old-time aviator suits. It sounds a little contrived, but it actually worked well. At times I felt like I was watching Sky Captain and the World of Tomorrow, or maybe Hell’s Angels. Sometimes pacing was a challenge. Twenty minutes could easily go by without any significant plot points happening. Then, all at once, a bunch of characters would burst onto the stage, kill each other and reveal that the protagonist’s twin sister, with whom he is in love, is actually already pregnant by him. Try capturing all that in 140 characters or less. At the end of my almost five-hour marathon tweeting session, I doubt many were still following my Twitter report. And the next day, several people asked me how I’d managed not to get killed by my date for being an obnoxious boor. But many people also told me they enjoyed following along. Some even said they might check out an opera themselves. As for me, I might do it again. But I’m not sure: Those ushers looked kind of cranky. My view of the whole opera, in 140-character segments from from my Twitter account, follows. Also, you’re not likely to get a very clear picture of the story from these tweets, I’ll admit. I was going for the flavor of the opera, and significant events, not a narrative. If you want to know what it’s all about, I recommend reading a good synopsis.